Don’t look at the answer below until you’ve formulated your own response. Congratulations if you are correct. If not, you sure are not alone. Might be time to explore the beautiful areas along the Columbia River. (Answer) Famed road builder Sam Hill constructed this memorial in 1918. He intended for it to be a landmark to honor the dead of World War I and to be a reminder that war is hell and that world powers should never again engage in such terrible folly. Residents of this quiet place along the Columbia River in the state of Washington went off to fight for their county. And some never returned. A Quaker and dedicated pacifist, Hill hoped that “The Great War” would be the war to end all wars. Wonder what he would think if he returned to the world today and saw that wars and rumors of wars still plague his beloved America and other countries? Hill chose to model his war memorial after Stonehenge, the famous prehistoric site in England. One of the wonders of the world, the original Stonehenge is a ring of standing stones set within earthworks. However, Hill chose to replicate Stonehenge based on a mistaken legend about the original in England. 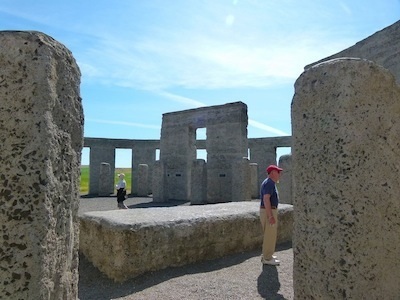 “At the time Sam Hill built his Stonehenge, people believed that the place in England had been used for human sacrifice,” said Ryan Downs, heritage leader for Un-Cruise Adventures. Hill’s message at his Stonehenge was that humanity is still being sacrificed to the god of war. Using slabs of reinforced concrete, Hill built his Stonehenge the way he thought the Druids would have built theirs if they had access to 20th century technology. The altar stone for Hill’s Stonehenge is aligned with sunrise on the summer solstice. Located off U.S. Highway 97 about two miles from where it enters Washington from Oregon, Stonehenge was dedicated on July 4, 1918. Joining Hill’s original war memorial are nearby monuments that were later added to honor soldiers of Klickitat County who died in World War II, Korea and Vietnam. If you visit, look down the hill in the direction of picturesque Mount Hood. At the base of the bluff overlooking the Columbia River is Hill’s final resting place, a concrete crypt. There is no easy path down the hill to the burial site. Some say Sam Hill intended it that way because he wished to be left alone in the countryside he loved so much.